The Tyler School of Art's 2018 Wearable Art Show: "Vestments." On April 25, hundreds of students, faculty, staff and parents will gather in the Tyler School of Art at Temple University for the 2019 edition of the school’s Wearable Art Show—a culmination of semester-long interdisciplinary planning, thought, creation, collaboration and one-on-one mentorship from influential visiting artist Machine Dazzle. Now in its third year, this free, public event—organized by students in the Fibers & Material Studies classes Body Art and Adornment and Sculptural Garments—will showcase some 75 works from nearly three dozen students in Tyler programs like Fibers & Material Studies, Glass and Sculpture and even Temple’s Department of Psychology. The Wearable Art Show will showcase works made from a range of media like fabric, glass, custom silicone prosthetics, LED lights and found objects from repurposed furniture to shoe soles and food packaging. Students will explore the limits of materials through this year’s theme “Estrenar,” roughly meaning “to wear for the first time” in Spanish. “I thought estrenar pairs well with the show because people haven’t seen these garments being activated—there’s been no movement yet,” said Salma Garcia, a Junior in the Fibers & Material Studies program who contributed the title of the show. Salma and other participants worked with faculty across Tyler as well as with New York-based artist and performer Machine Dazzle, known for his gender-bending costume designs for iconic performance artist Taylor Mac. Machine offered students critiques on their work, such as how to evoke emotion with a garment, as well as insights on performance. 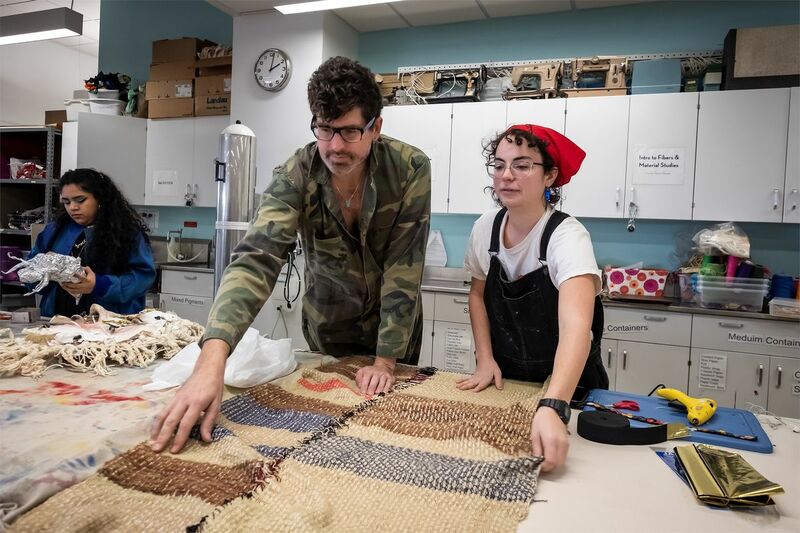 Visiting artist Machine Dazzle works with Fibers & Material Studies major Victoria Fulton at the Tyler School of Art in anticipation of the Wearable Art Show. Machine, faculty and students also worked together to construct flowers from fabric, tissue paper, pipe cleaners, recyclable materials and found objects to line the perimeter of the runway, activating Tyler’s expansive green hallway. Each wearable art object in the show will be modeled by students and set to a DJ’s thumping beats. Tyler invites the public to come experience what has rapidly grown into the school’s signature, high-energy closing statement of the spring semester.